: Cold liquid at initial temperature is pressurized reversibly to a high pressure by a pump. In this process, the volume changes slightly. : Reversible constant pressure heating in a boiler to temperature . : Heat added at constant temperature (constant pressure), with transition of liquid to vapor. : Isentropic expansion through a turbine. The quality decreases from unity at point to . 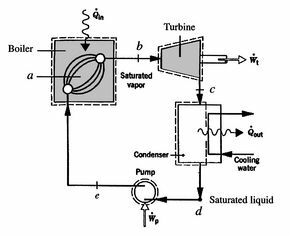 : Liquid-vapor mixture condensed at temperature by extracting heat. In the Rankine cycle, the mean temperature at which heat is supplied is less than the maximum temperature, , so that the efficiency is less than that of a Carnot cycle working between the same maximum and minimum temperatures. The heat absorption takes place at constant pressure over , but only the part is isothermal. The heat rejected occurs over ; this is at both constant temperature and pressure. For the Rankine cycle, , . From this equation we see not only the reason that the cycle efficiency is less than that of a Carnot cycle, but the direction to move in terms of cycle design (increased ) if we wish to increase the efficiency. In the two-phase region, constant pressure means also constant temperature, so the slope of the constant pressure heat addition line is constant and the line is straight. The effect of irreversibilities is represented by the dashed line from to . Irreversible behavior during the expansion results in a value of entropy at the end state of the expansion that is higher than . The enthalpy at the end of the expansion (the turbine exit) is thus higher for the irreversible process than for the reversible process, and, as seen for the Brayton cycle, the turbine work is thus lower in the irreversible case. The Rankine cycle is less efficient than the Carnot cycle for given maximum and minimum temperatures, but, as said earlier, it is more effective as a practical power production device.